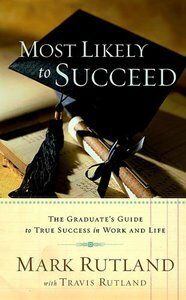 Just in time for the graduation season, Mark Rutland provides graduates with nine timeless keys to prosperity and success in life. Rutland takes a fresh look at essential characteristics such as courage, loyalty, diligence, honesty, reverence, and gratitude, and reveals why each of these qualities is so necessary in today's postmodern era. Rutland skillfully guides today's graduate to begin developing these characteristics that lead to succss now and throughout life. About "Most Likely to Succeed"